I am going to jinx it I know, but the sun has been shining and the weather has been warm for a whole week now. It’s making me sure spring is here. Now I am dreaming of sunny walks and brunch with friends. So what do you do when spring is coming? 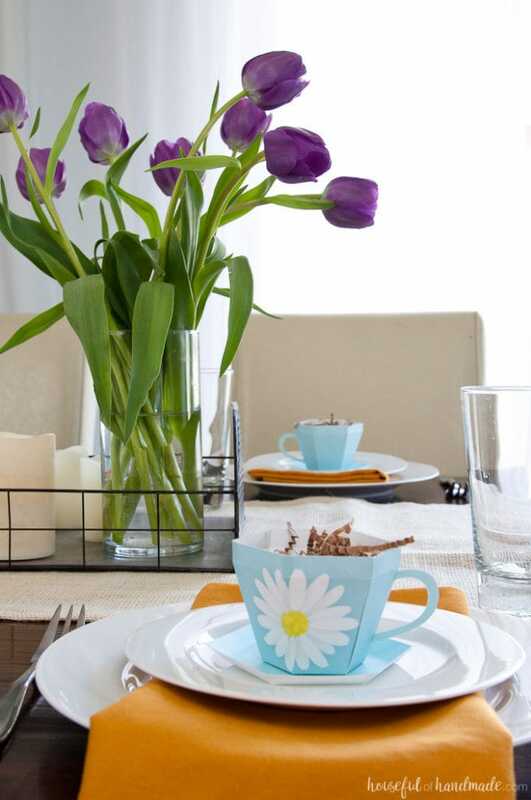 Decorate your dining room for brunch with the perfect Spring Tablescape with paper tea cups. Isn’t spring such a wonderful thing? It’s full of hope. I just love when the first buds start peeking through the ground. And the sun gets brighter. It makes it so much easier to decorate the house with a bit of color. 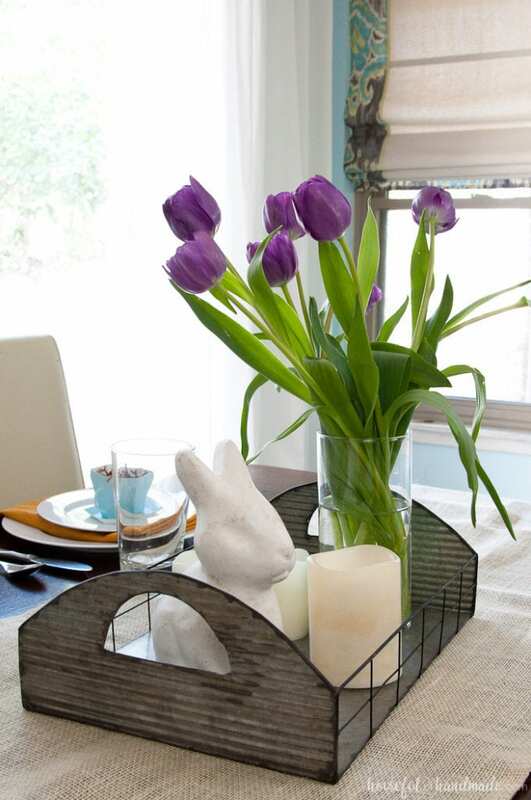 For our spring tablescape, I chose to to focus on flowers. It started with a simple vase of tulips blooms. Any color will work because spring is all about color. 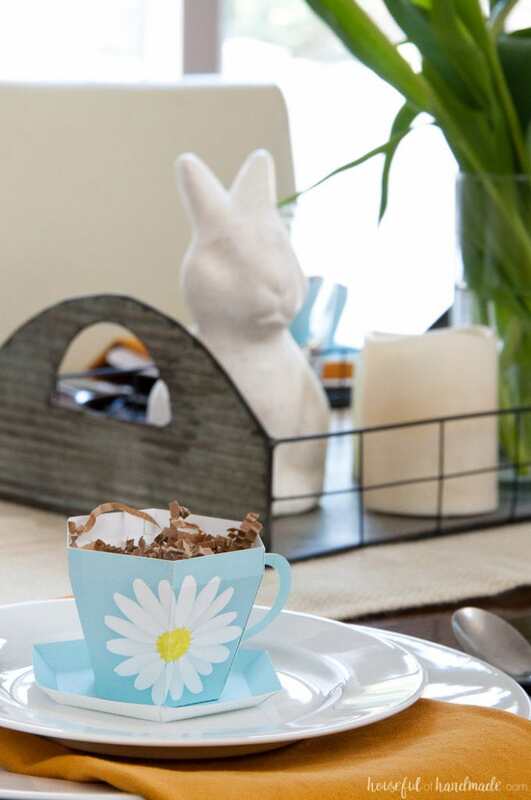 Then to add a little rustic Easter charm, I added a bunny that I bought last year in the Target Dollar Spot (yeah, it’s foam). A few wax LED candles and things were coming along. To bring it all together, I put my collection of spring finds in a metal tray. Trays are the best for corralling found items to make a collection. To give our dark wood table some brightness, I added a cream burlap table runner. Then set the table with basic white plates from Ikea. I love these simple plates because they can take on any personality based on how you dress them up or down. And because they are super inexpensive, I have a table setting for 24. Perfect for big dinner parties, or if one accidentally gets broken. To add a little color to the plates, I added a yellow cloth napkin. Nothing too fancy, just a peek of color. And then I topped them off with these floral paper tea cups! Aren’t they just the cutest thing ever. 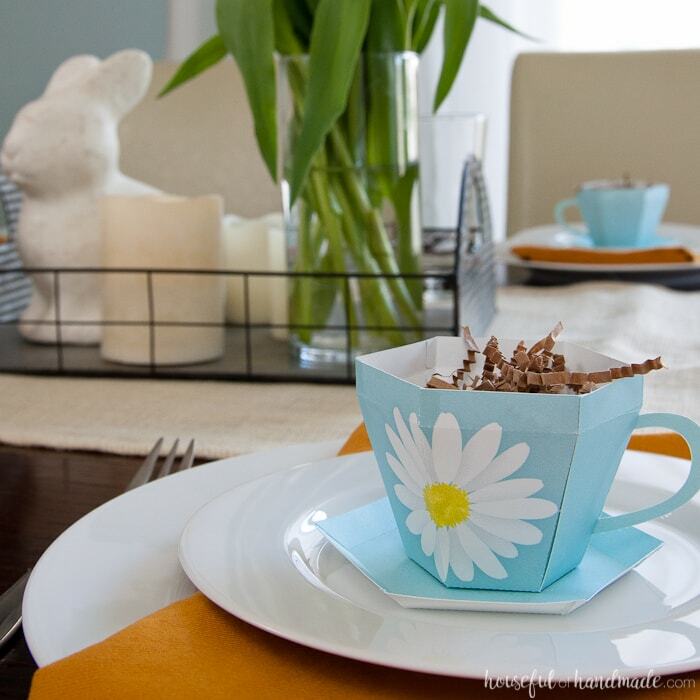 These 3D paper tea cups look just like spring with their soft blue color and bright daisy design. 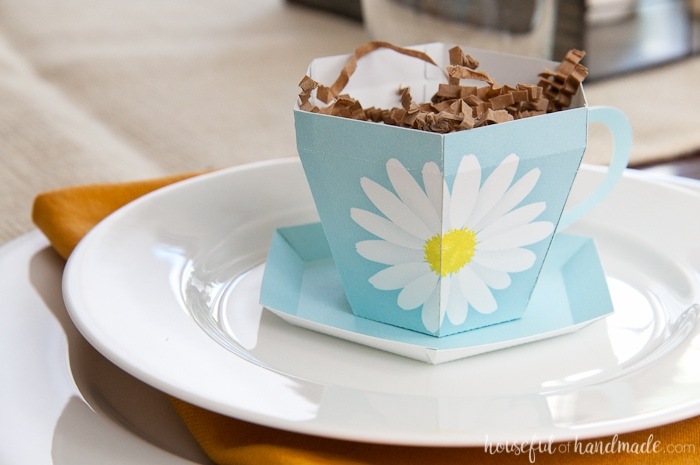 You can use them as a place card for your guests, or to hold a special treat. 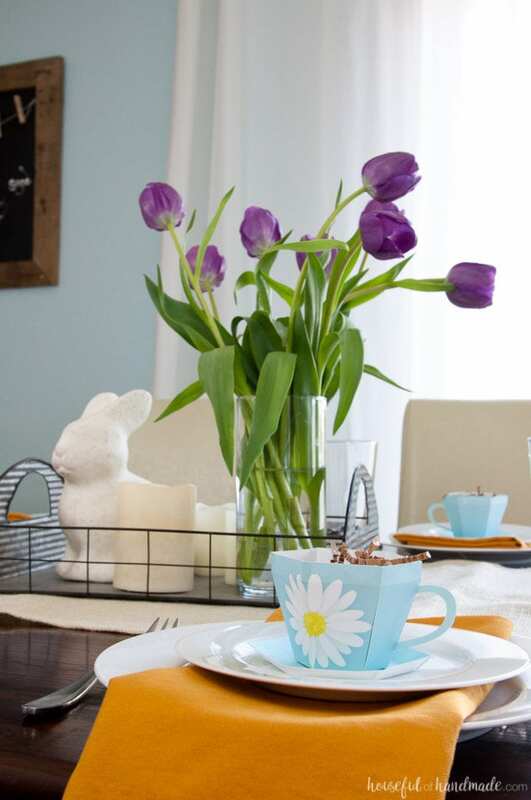 Or how cute would they be for Easter brunch with a perfectly dyed Easter egg nestled in each one? Or for Mother’s Day, they can hold a special gift (maybe jewelry!). The possibilities are endless. Whatever you want to do with them they are super cute for spring! 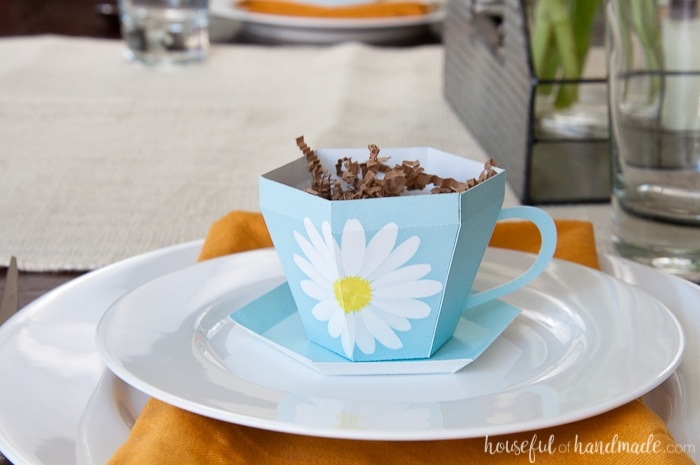 Our spring tablescape looks extra perfect for spring with these beautiful paper tea cups. And bonus, I am sharing the free template for them over at Oh My! Creative. Click here for the file and tutorial so you can make your own. This week I also finished out spring mantel, which is full of more flowers. Our house is really ready for spring. Now we just need the sun to keep shining! 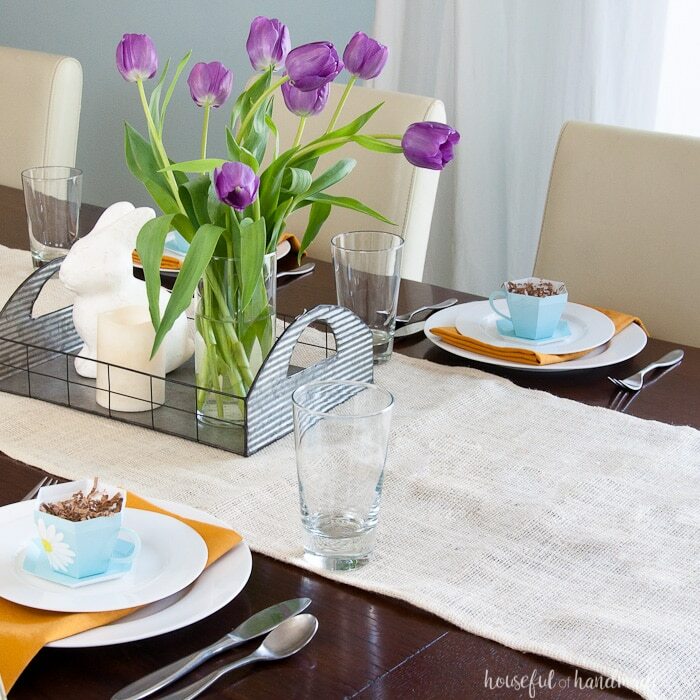 Kati, I love this tablescape!! So beautiful and those paper cups are adorable! Featuring you tonight at our party! OMG! Where did you find that bunny? I am obsessed with bunnies!!! Fingers crossed you JUST found it at a national store! ha!